Every year, without fail I go to the Melbourne International Comedy festival. For me, it is a flagship event in Melbourne that opens up worldwide opportunities for up and coming comedians from home and abroad. I always try and find a few comedians that are hosting their first series of shows – it is always a risk (sometimes awkwardly, just five of us sitting in a cloak room or carpet room of the Melbourne Town Hall) but I love giving my support to those that need the encouragement the most. My favourite funny regulars include Jason Byrne (who for the first time in several years has not made it), Arj Barker – who gets funnier each time I see him – and this year, I decided to see Wil Anderson. Ordinarily, I’ve not been a fan of the increasingly popular, somewhat crass “country Victorian”, but after so much enjoyment from his ABC shows The Gruen Transfer and Gruen Planet I felt it was time to see what all the fuss is about. Turns out I was right and see a career change from writer to psychic taking place effective immediately. 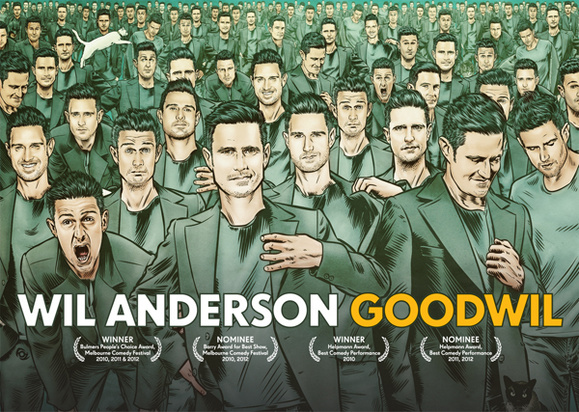 Everyone must see Wil Anderson – GoodWil. It is one hour of pure comedy gold, where Wil Anderson does a remarkable job at engaging with the audience both in an impromptu and rehearsed sense. His timing is impeccable, his delivery is overwhelmingly relatable to an Australian audience and most importantly – he says what is on everyone’s mind, “No I am not Adam Hills!” Anderson is more intense than he appears on TV – there are of course far fewer ‘codes of practice’ to uphold on the live stage. His energy is at times claustrophobic and hard to keep up with but this is also why he is a great entertainer. Audiences really have to listen to what he has to say and he is not afraid to say what is on his mind – whether it be Australian politicians, lifestyle choices (Anderson is an avid Vegetarian that refuses to inflict his decision on other) or reflections of his seemingly personal childhood – Anderson refuses to draw a line, and the formula works. In its 27th year, the Festival is the third largest comedy event in the world and has over 600,000 attendees each year; the events range from the big architectural theatres with the headline acts, to free, dark and dingy pubs around town sporting newcomers to the scene. 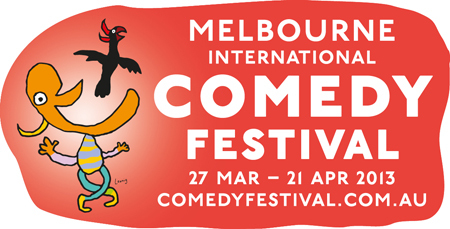 The Melbourne International Comedy festival runs thought April each and every year. It is a great night out and a great way to share Melbourne with the rest of the world.